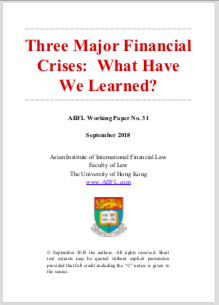 "Three Major Financial Crises: What Have We Learned"
Abstract: Few experts predicted the Asian Financial Crisis of 1997-1998, or the Global Financial Crisis of 2008 and its close companion the Eurozone Debt Crisis of 2010, and we certainly do not pretend to be able to predict the next one. Yet history teaches there will be another crisis and probably sooner rather than later, and, of course, in the decade since the start of the Global Financial Crisis, the Eurozone crisis has been ongoing in many of its dimensions. Fragility that periodically erupts into a full blown financial crisis appears to be an integral feature of market-based financial systems in spite of the advent of sophisticated risk management tools and regulatory systems. If anything the increased frequency of modern crises since the collapse of the Bretton Woods international monetary system and the period of financial internationalization and globalization which has followed, underscores how difficult it is to prevent and deal with systemic risk. We thus seek to compare and contrast these three major crises both to distill the lessons to be learned, and to identify what more can be done to strengthen our financial systems. The following sections will provide an overview of each crisis in turn, considering in particular (i) its causes; (ii) the effectiveness of policy responses; and (iii) the lessons. In the conclusion we seek to draw some common themes from these experiences going forward. Click here to download the full paper.